Though we often imagine dinosaurs as being reptilian monsters, recent research indicates they were actually the feathered ancestors of modern birds—and a new exhibition at the American Museum of Natural History details just how closely linked the creatures are. There’s an “intimate connection” between the avian species we see around the world today and extinct dinosaurs, as AMNH’s provost of science, Michael Novacek, put it in a panel discussion at a press preview for the exhibit. It’s an idea that was first put forward in the 1860s, but is just beginning to gain widespread acceptance. Only in the last 25 to 35 years have researchers truly begun to dig into the topic, but now, it’s almost indisputable: birds are dinosaurs, in the same way that humans are mammals. “You could argue that we still live in the age of dinosaurs,” AMNH’s paleontology curator, Mark Norell, argues, considering there are about 18,000 species of birds in the world, and only about 4500 species of mammals. Here are nine facts about the many bird-like characteristics of dinosaurs from the exhibit, "Dinosaurs Among Us," that will have you rethinking Jurassic Park. Some scientists suggest that all dinosaurs had some degree of feathers, though the physical evidence may not be apparent in all fossils. “There’s as much evidence that Tyrannosaurus rex had feathers as that an Australopithecus like Lucy had hair," according to Norell, who chairs the museum’s paleontology division. Like elephants are covered in very light hair, some dinosaurs may have had limited feathers, while others were fully covered. Even for non-flying dinosaurs, feathers would have been useful for sensing the environment and for keeping warm. 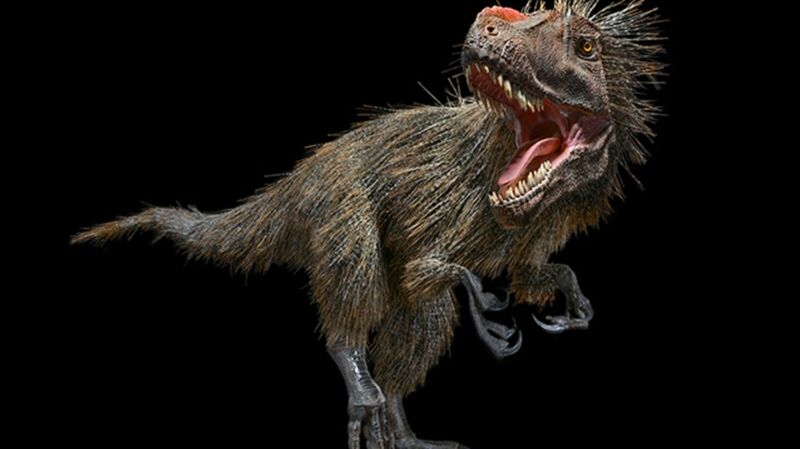 Though you wouldn’t know it from dinosaur movies, T. rex and the Velociraptor were most likely covered in feathers. 2. THEIR JOINTS WERE SIMILAR. Velociraptor mongoliensis had hinged ankles and swivel-jointed wrists, with three toes—just like a bird. 3. THEY HAD HOLLOW BONES. Birds’ hollow bones are light but sturdy—perfect for flight. But there’s evidence that hollow bones evolved long before animals took to the skies. Allosaurus, a large theropod (bird-ancestor dinosaurs) from the Late Jurassic period that grew up to 35 feet long, also had hollow bones. 4. THEY SLEPT IN SIMILAR POSITIONS. Some fossils from as early as 128 million years ago have shown dinosaurs sleeping in a distinctly bird-like position, with folded limbs and their head tucked under one arm. This curled position is a way for birds, as well as other warm-blooded animals, to retain heat while they sleep, and could indicate that dinos were warm-blooded, too. A Cretaceous Thanksgiving could have involved the ceremonial cracking of a wishbone, too. The furcula was originally thought to be a distinctly avian characteristic related to flight. However, the bone (two clavicles fused together) can also be seen in dinosaurs, including the T. rex. Birds sit on their eggs to keep them warm before they hatch, a behavior called brooding. A fossil discovered in the Gobi Desert in 2012 indicates that dinosaurs were also brooding animals. The fossil captures the dinosaur Citipati osmolskae over the center of its nest, protecting its eggs with its forearms just like a modern bird would. 7. THEY HAD EXTREMELY EFFICIENT LUNGS. Birds’ lungs are about twice as efficient as mammals’, according to Norell, and it seems that dinosaurs shared the same type of respiratory system. The avian respiratory system’s secret lies in a series of air sacs that funnel air into and out of the lungs. Unlike humans, who breathe in and out using the exact same airway, the air birds breathe moves in just one direction. It enters into one of these sacs, and is exhaled from another, limiting the amount of mixing that goes on between fresh, oxygen-rich air and stale air. These air sacs leave impressions that can be seen in vertebrae, helping scientists confirm that dinosaurs had a similar respiratory system. Aki Watanabe, a Ph.D. student at the museum’s graduate school who studies respiration in dinosaurs, describes fossilized bones looking like Swiss cheese—full of holes. 8. THEY HAD SIMILAR CLAWS. The South American hoatzin is one of the oldest bird species still with us, originating about 64 million years ago, and they have a distinctly dino-like trait: claws. Young hoatzin have claws on their wing bones to climb back into the nest if they fall or leave to hide from a predator. However, by the time the birds reach adulthood, these claws fall off. 9. THEY LOOKED SO MUCH ALIKE, THEY RECEIVED BIRD NAMES. The name Struthiomimus altus means “ostrich mimic.” The dinosaur had long back legs like an ostrich, and a beak. Psittacosaurus, a relative of Triceratops, translates to “parrot lizard.” The dinosaur was named after its parrot-like beak, and it also sported primitive feathers along its tail. Dinosaurs Among Us runs between March 21, 2016 and January 2, 2017 at the American Museum of Natural History in New York City.